Reliance Jio is going to make available a QWERTY-keypad based smartphone soon. 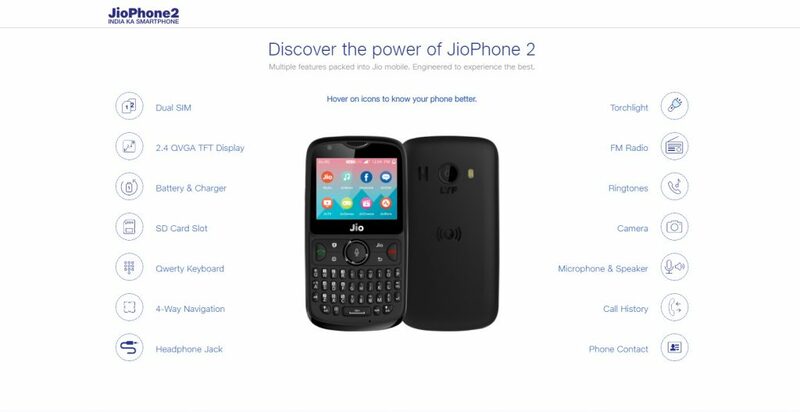 It is the JioPhone 2. The JioPhone 2 was announced at the 41st Annual General Meeting (AGM) by Reliance Industries Limited (RIL). The JioPhone 2 is going to be made available at Rs. 2,999/- on Independence Day (August 15). The pricing looks to like an introductory offer. This smartphone looks similar to a BlackBerry smartphone. The JioPhone 2 runs KAIOS. It also has support for VoLTE. The JioPhone 2 has been priced Rs. 2,999/- in the Indian smartphone market. Jio’s latest smartphone will be available for purchase from August 15, 2018. JioPhone 2 is being launched as the heir to the first JioPhone. Jio’s latest smartphone has a QWERTY-based keypad. It has 4 GB of internal space. Jio’s latest smartphone is available in Black only, currently. Jio’s latest smartphone is a low-cost budget smartphone offering VoLTE support. The handset has a bar design. It is small in size improving phone handling. This time around, there are rear and front sensors for imaging. You get a 2,000-mAh battery, supporting around about 14 hours of talk time. Jio’s latest smartphone’s voice assistant has a dedicated button. Jio’s latest smartphone supports 24 Indian languages, with various voice command support. Jio’s latest smartphone will come with Jio apps: JioCinema, JioTV, and JioMusic pre-installed. Jio’s latest smartphone has been positioned at first time users. Jio’s latest smartphone also targets budget users.